After promptly purchasing our Oceanjet ticket at the counter in Pier 1, we boarded the fastcraft to Tagbilaran, Bohol’s capital. The vessel wasn’t full so as soon it left port promptly at 7am, we changed seats. We all managed to catch some winks in the 2-hour trip. I was especially lulled as the fastcraft rocked along a mildly turbulent section. Disembarking at the Tagbilaran port, we were met by touts offering transport and tours. We found our driver which we had booked earlier (Php 1,600/pax based on 3 pax) for a private “Countryside Tour” on board a car. 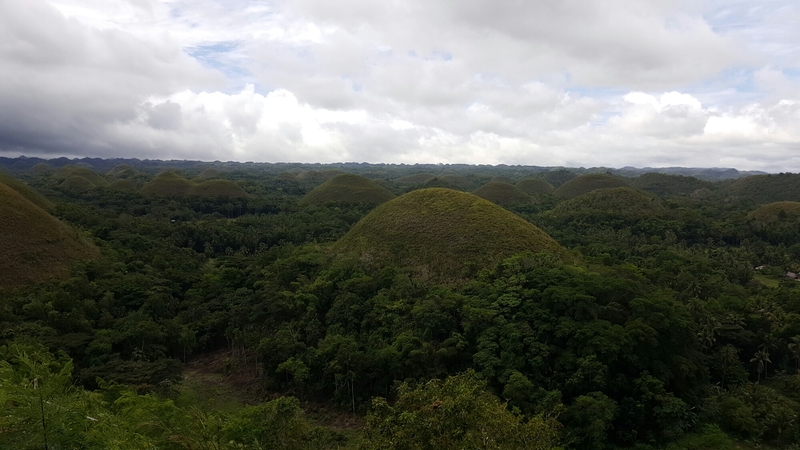 The only time I had been to Bohol was at Panglao more than a decade ago so this was all new to me. It was interesting how the driver seemed apologetic that they only had 3 small malls and no SM. I guess, malls have become some sort of status symbols for locals to show-off to tourists (“See how progressive we are! There’s an SM!”). I did tell him that 3 malls is actually too many and they have no need for an SM. Let me say that again: They have no need for an SM. The lush landscape stretched as far as the eyes could see. It was relaxing just looking at the green gorgeousness. Geological explanations aside, it was easy to imagine that these mounds were caused by two quarelling mud-slinging giants. 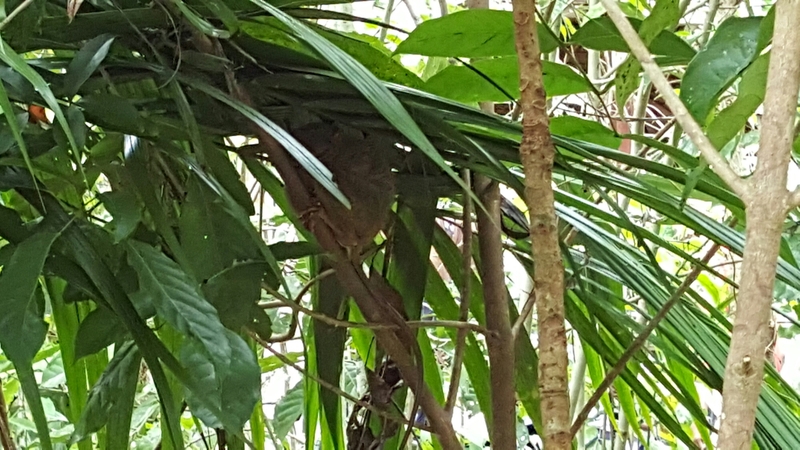 Next stop were the tarsiers at the Tarsier Conservation Centre. The small patch of land had about 5 resident tarsiers clinging on to sign-posted trees where helpful guides point them out to you. Being nocturnal animals, these cute primates were obviously NR (no reaction). Annie said that in her last visit a few years ago, guides would put them on visitor’s shoulders for photo-ops. Thankfully, it has since been stopped. I was surprised they even did it in the first place. 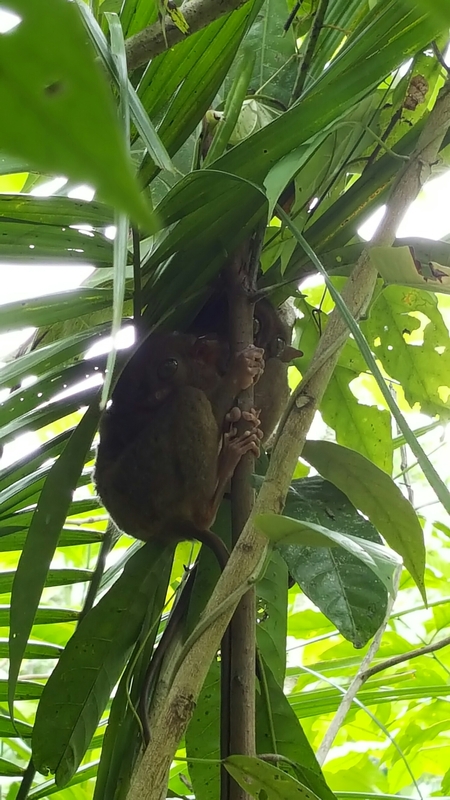 Tarsiers get stressed easily. They’re solitary animals and when they get stressed, they bang their heads on trees to commit suicide. It’s always best to leave them by their lonesome selves. They also hate noise so keep quiet. 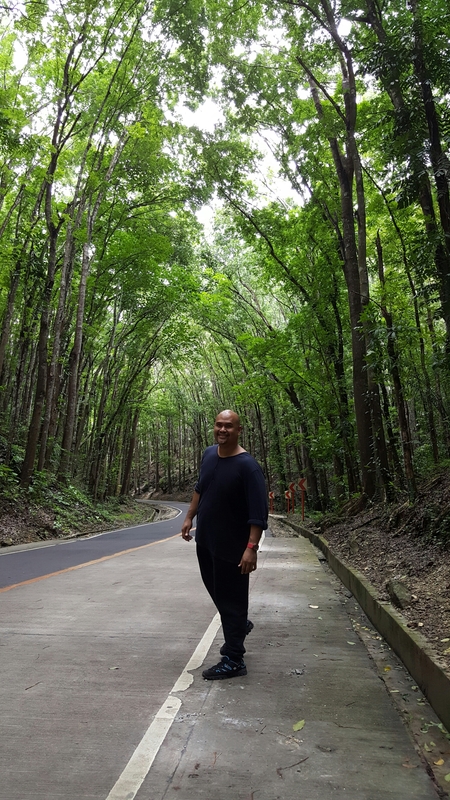 On our way to the hanging bridge, we passed through the forest that was planted in the 1960s to prevent soil erosion. Pretty enough for photo-ops. Just make sure you don’t get run-over by speeding vehicles. 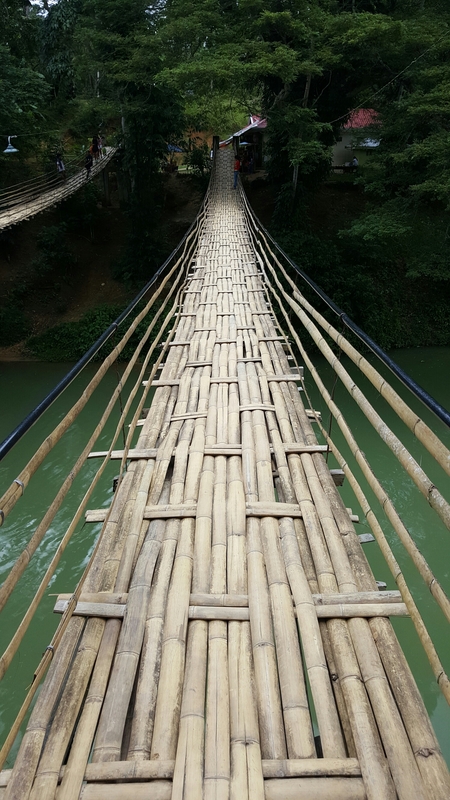 This bridge is used by locals but has since been turned into a tourist attraction and was featured in a popular film. Nothing to do much here but to cross and be met by a few souvenir stalls and refreshment vendors. 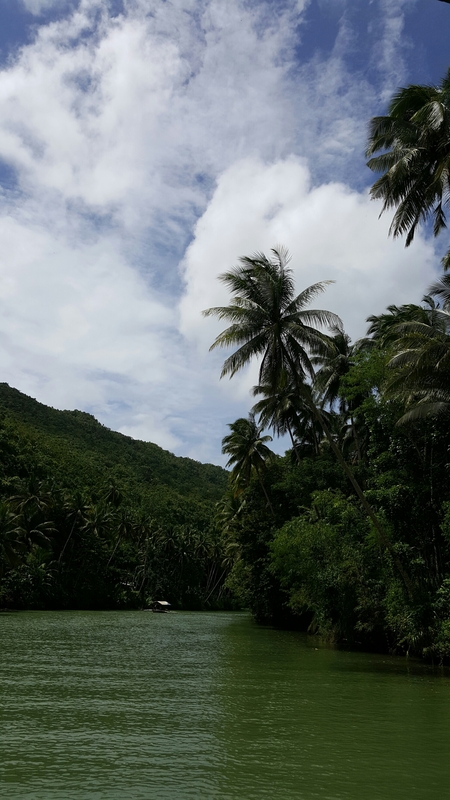 It was 12nn when we got to the boat docks for lunch at one of the floating restaurants at the Loboc River. Our driver got us our tickets which we presented at the counter and we were directed to the right gate and boat. All very efficient. The buffet lunch was fried chicken, pork barbecue, fried fish fillet, pansit, some salads, dessert, and bottomlessiced-tea. Generally good for the price and place. We started eating while still docked. As the eating wound down, the trip began (you can continue eating all throughout the trip). Our assigned table was at the front of the boat which gave us unrestricted views. The acoustic music of the “manong” was fun but I think I prefer silence or at least Visayan folksongs (he did sing a few though) for better atmosphere. 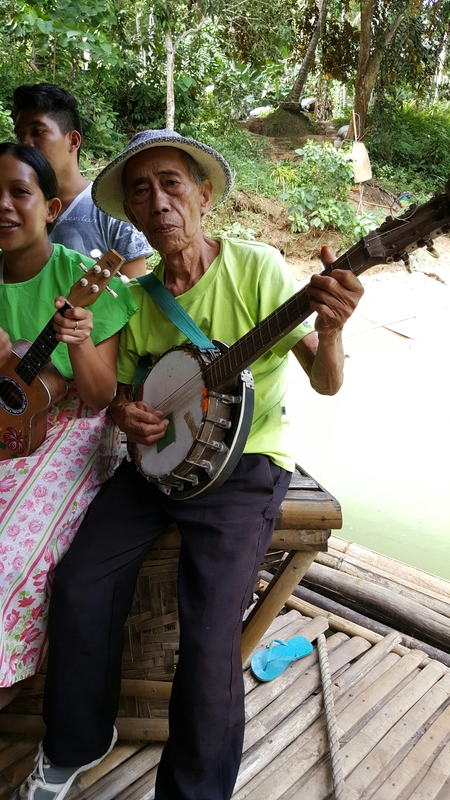 The trip included a stop at one of two riverside platforms where locals sings songs and play ukelele. More interesting is the old man playing the bandurria. The experience was worth it, albeit touristy with all the singing and the lunch was not too bad. The river wasn’t crowded as they seemed to time the boat departures. 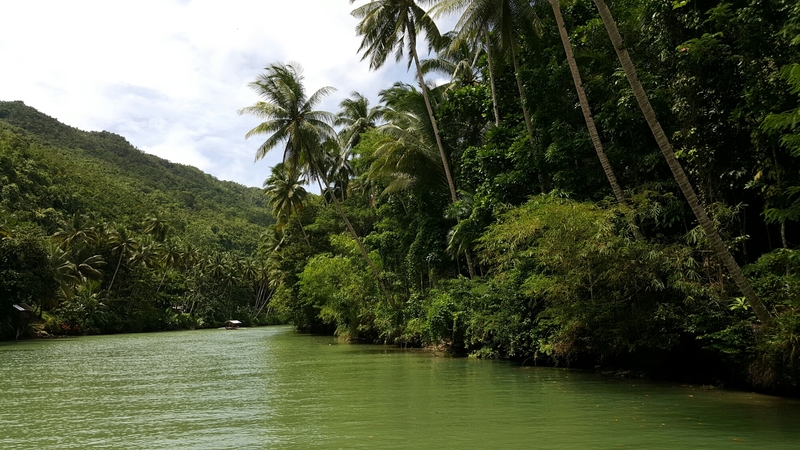 I saw a small banca with two foreign tourists and I think I would prefer that as it would be closer to the water and quieter. After lunch, it was time to see snakes and butterflies. Unfortunately, unless you’re a die-hard fan of snakes and butterflies, you can skip the attractions known as Giant Snake and the Butterfly Farm. The latter just features the stuffed 5ft python that was caught in the wild in 1996, kept in captivity, and died in 2003. There are 2 resident pythons now (not as big) plus a few smaller ones. The caged animals (monkeys, civet cat, and birds) are a big big NO. The only entertaining person there is a cross-dresser named Marimar who has been guiding guests around since 1996. Her spiel is funny and even entertaimed us with a lipsynced number. 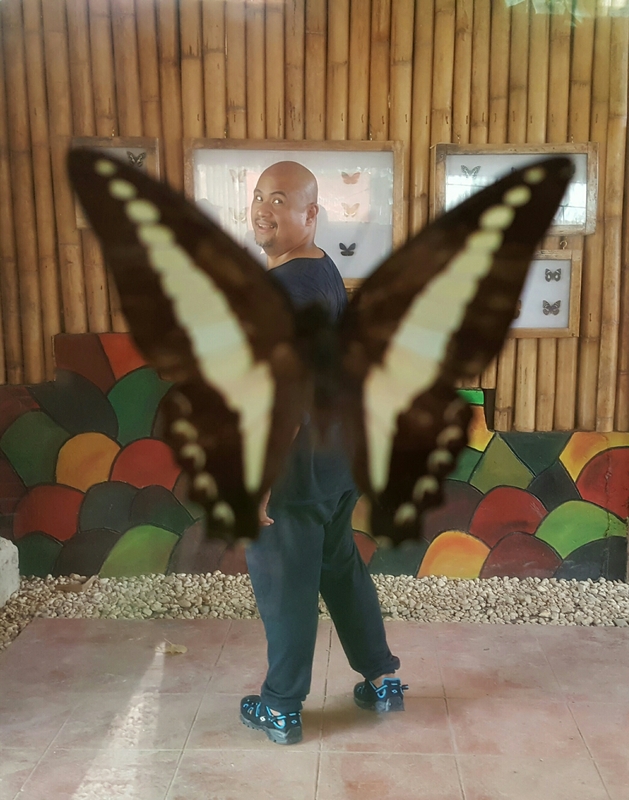 In the case of the butterfly farm, there were just a few butterflies in a small enclosure of bonsais. 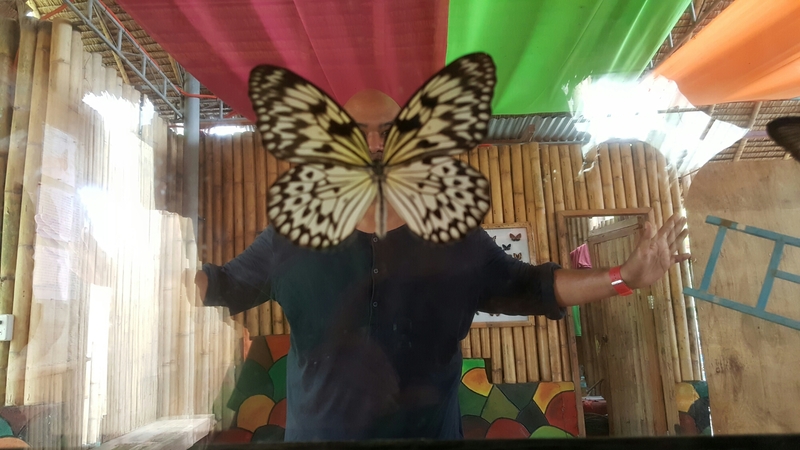 The only fun thing to do is having your pic taken super-imposed with butterfly wings. We skipped the Blood Compact shrine as it was just a monument by the side of a hotel facing the sea. They shouldn’t have allowed the hotel to be built as it simply relegated the shrine to a mere cramped side attraction. We also skipped the churches as they’re still being rebuilt from rubble after the devastating earthquake. Back at the pier, we managed to change our 6am tickets to 3:30 which was departing in a few minutes.